Area landowners gather in Oak Hill High School to discuss the potential harvesting of land in Wayne National Forest. 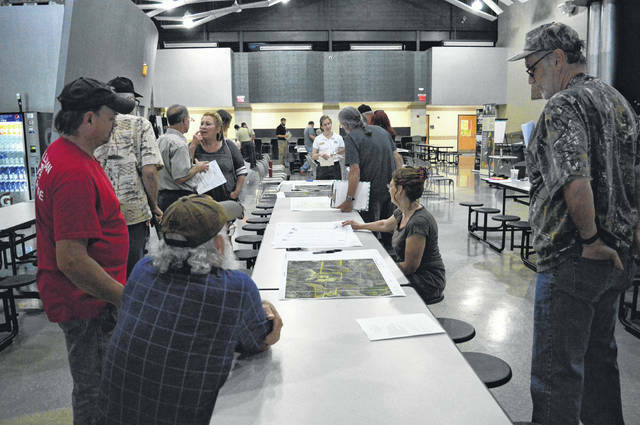 OAK HILL — Landowners bordering the Wayne National Forest gathered in the Oak Hill High School cafeteria Thursday evening to discuss concerns and questions with the Sunny Oaks Project. Employees of the Wayne National Forest presented before landowners as part of a process called scoping in order to collect information about their opinions and feelings as well inform participants as to the proposed process. From previous information presented to Ohio Valley Publishing by the Wayne National Forest, the project, called The Sunny Oaks Project, is located east of State Route 93, west of State Route 141, north of the community of Aid and south of the community of Oak Hill. The project area is located in parts of Jackson, Gallia, and Lawrence Counties. Around 1,000 acres of forest would be harvested in Gallia, predominantly in Greenfield Township and some in Perry Township. The cutting process, if approved, could potentially take up to eight years. Wayne Forest employees presented information on the process of prescribed burning as well as cutting in the hopes of diversifying the types of forest regions throughout Wayne. They said that much of Wayne can be considered old forest and with land management, the park hopes to strengthen wildlife populations in brushy, young forest areas as certain wildlife types reportedly survive better in such conditions. The project also seeks to promote the growth of Oak and Hickory trees as reportedly Maple trees have come to dominate some parts of the forest. Groups would eventually separate to discuss with forest employees over maps centered around the proposed harvest areas. After the groups split, they returned to the center of the room for a question and answer session with Slone. Park employees said one of their first steps were to address landowners as they felt they would be the most affected by changes to the forest. The landowner meeting is simply the first of more to come as forest officials reach out to the public, they said. Money raised from the sale of timber would reportedly in part go back to local counties, schools where the forest resides and county government. In order to reach the habitat goals of the forest, park employees said the timber had to be a “product that is financially beneficial” to harvesters in order to pay for the land’s diversification. A resident of Aid in Lawrence County was concerned with how the cutting of trees would effect waterflow in the Symmes Creek Watershed and if it would increase flooding. He emphasized flooding at times was already dangerous for the region and its occupants. Slone responded that hopefully those concerns would be addressed as an environmental study was completed at a later date. One man said he was concerned that with the construction of roads in the area, would it lead to the potential for fracking later in the forest. Slone said that was not the scope of this project, but simply to regenerate forest growth. Some landowners expressed concern that they felt the Sunny Oaks Project was a reincarnation of a previously abandoned effort called the Buckeye Habitat Improvement Project. Forest employees wrote down concerns of residents and asked them to leave contact information so home visits might be scheduled so landowners could interface personally with them to address concerns on properties. Should the project be approved, at earliest, Slone said it would go to bid in spring of next year. Both she and her husband Rick were present to see how the Sunny Oaks Project could affect area tourism business and activities. Residents may also call to discuss this project at (740) 753-0101 during normal business hours (Monday through Friday, 8 a.m. to 4:30 p.m.) or submit comments electronically to: comments-eastern-wayne-ironton@fs.fed.us.